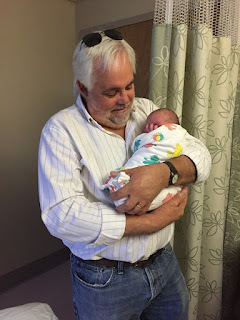 with his newest grandchild, James. If you ever watched or attended an Elk Grove City Council meeting anytime in the City's 16-year history, chances are you have seen resident Michael Monasky speak. Never shy to have his views heard, Monasky has spoken with passion on a vast array of issues, with a particular emphasis on governance and environmental issues. It is that passion, particularly for environmental issues and increasing resident participation in local government decision-making that drew the longtime Elk Grove resident to enter this year's Mayoral race. Monasky who frequently addresses the City Council during the public comment period of twice-monthly meetings maintains the public is given inadequate time to discuss any number of issues facing the city. "I don't think three minutes is enough to talk about an issue," Monasky said. "There is so much more that needs to be done to include people in the democracy." Monasky went on to say that not only should residents be given more opportunity to participate, but they should also be setting the agenda. To help residents, the City should also work directly with communities within the city to help strengthen neighborhoods. "The City should help the people that want to come forward and organize themselves," he said. Monasky said that residents should be given direct assess to city departments, such as planning, to help address and solve problems in neighborhoods in open meetings. "The residents should have open access, and [real estate] developers should not have closed access anymore," Monasky said. To facilitate more participation, and improve access to city resources, as Mayor Monasky would push for the creation of what he calls planning assemblies. The monthly assemblies for each of the City's four council districts would provide residents an opportunity to address problems and initiate action. "As Mayor, I would push forth that notion 'that yes, it is a little chaotic, it is a little conflicted,' that's OK, we are all right with that," he said. Another topic that Monasky has long advocated for has been environmental issues. One of the most recent examples he has commented on at City Council meetings has been the handling of green waste by the city's contracted garbage collector, Republic Services. "When we don't have good governance, and we don't have participatory democracy, we end up with a stupidity of government where the city council does maddeningly stupid things," he said. "For instance it lets the waste hauler sell our green waste for incineration instead of transforming it into compost." Monasky also criticized the city for frequently bypassing the environmental considerations of projects that expand the city's boundaries and that "it neglects our agricultural roots forcing out longstanding farming families with threats of expanding development." He also noted the City has withdrawn from the South Sacramento Habitat Conservation Plan. As part of his focus on improved governance, Monasky said he would also push for clearer reporting by the various city departments. As an example, Monasky said he cannot get a straight answer from Elk Grove's finance director regarding various departmental reports. "I can't get a straight answer from the finance director about his monthly treasurer report other than incomprehensible gibberish," he said. "I am concerned because we are living in a world where our global financial markets are paying negative interest in Europe, and that may be happening here." Below is an audio statement from Monasky.